With its corridors of blood, creepy twins, overwhelming sense of dread and isolation; The Shining (1980) is undoubtedly one of the most disconcerting movie experiences of all time. Stanley Kubrick’s kaleidoscopic direction and Jack Nicholson’s intense performance elevated Stephen King’s bestselling novel to new heights of terror; influencing popular culture like no other horror film before it. But did you know it also contains the UK’s favourite film quote? 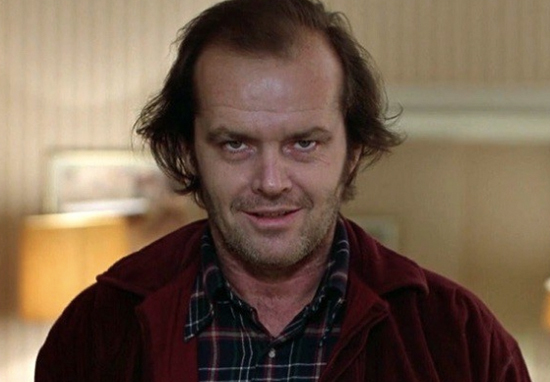 Yes, the eternally petrifying – and improvised – catchphrase ‘Heeere’s Johnny!’ has come up top in a poll of the UK’s favourite film quotes; devouring 27 per cent of the votes like a soul-hungry Overlook Hotel. In close second came family favourite The Wizard of Oz (1939) which landed a spellbinding 26 per cent of votes with the far more comforting ‘There’s no place like home’. The Wizard of Oz was also voted as the UK’s most highly ‘quoteable’ film. In third place was the forever shady ‘Frankly my dear, I don’t give a damn’ from sweeping romantic epic Gone with the Wind (1939). This research was carried out to mark the release of Warner Bros. Iconic Moments film collection, with 2000 UK adults being polled on how they mention movies in their daily life. The results are certainly interesting to all of us who love throwing an apt film reference into everyday conversation, although I must say I’m disappointed the quote mine which is Mean Girls didn’t get a mention. Some quotes from classic movies have become so imbedded in popular culture over many decades that they’ve turned into idioms we all end up using on a regular basis. Dorothy’s observation that ‘…we’re not in Kansas anymore’ isn’t specific to Oz now. It’s an everyday, tongue-in-cheek phrase we’d say to anyone when we experience something new. And ‘Hey you guys’ – said in the same sing-song way as Sloth – is heard as a ‘Hello’ regularly. Some quotes, like Gone with the Wind’s ‘Frankly my dear, I don’t give a damn’, are thrown into conversation with a touch of sarcasm or for a laugh. Especially in relationships, or with family and friends. You just have to be sure they’re not going to take you too seriously! The research shows that the 16-24 year-old generation includes the most prolific quoters, with two-thirds (63 per cent) using film phrases in conversation. That’s interesting considering that none of the UK’s top five quotes was released during their lifetime. It all highlights the lasting impact of these movies and their enduring appeal: even those born long after they were released still go back and watch these films; they’re still cultural touchstones. There’s a kudos that goes with referencing movies, and with the explosion of movie quote memes and GIFs on social media, you see how film phrases are now also used by this generation as social banter, to react and respond to a status, comment or event. The art of film quote dropping changes slightly between generations. One quarter (25per cent) of 16-24 year-olds admit to referencing films to demonstrate their superior film knowledge to others, while one fifth (21 per cent) of 25-34 year-olds reportedly quote movies to impress either a romantic partner or a date. However, priorities apparently shift once you hit 35. Among 35-44 year-olds, 46 per cent usually impersonate film characters for nostalgic effect while reminiscing with family members. East Midlands residents were found to be most likely to reference using quotes, with two thirds (63 per cent) dropping cinematic lines into everyday conversation; a high percentage when compared with just 45 per cent of those in Wales. Which film do you find yourself quoting on the regular?